Great taste gold 2011. The real flavour of India. Gluten free. No artificial colours, flavours or preservatives. Suitable for vegans. Vegetarian Society approved. Kosher - KLBD. 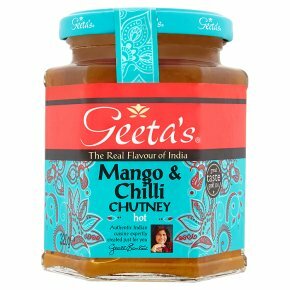 "Inspired by a family recipe, I have combined carefully selected spices with succulent fruit to create a unique tasting Indian chutney. Enjoy it as a meal accompaniment or with Indian bread and poppadums." Add the delicious taste of my chutney to any meal, bbq or snack for that great Indian flavour. For a quick and easy treat spread some over a cheese toastie or add a dollop on a jacket potato with butter.